One of my favorite things to bake is homemade bread ….. because one of my favorite things to eat is homemade bread! Ha! Even though I have good intentions when it comes to making bread for dinner, sometimes, I forget. 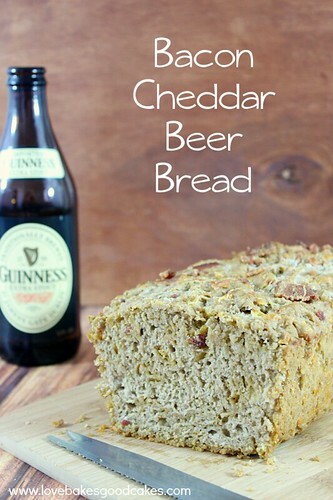 Thankfully, this Bacon Cheddar Beer Bread is quick and easy to whip up in my times of need – and my family loves it! 1. Preheat oven to 375F. Spray a 9×5-in. loaf pan with cooking spray and set aside. 2. In a large bowl, whisk together the dry ingredients, seasonings, half of the bacon and all of the cheese. Stir in 2 tbsp. of melted butter and the 12 oz. of beer just until the mixture is combined. 3. Pour the batter into the prepared pan. Pour the additional 2 tbsp. of melted butter over the top. Sprinkle with the remaining half of bacon. 4. 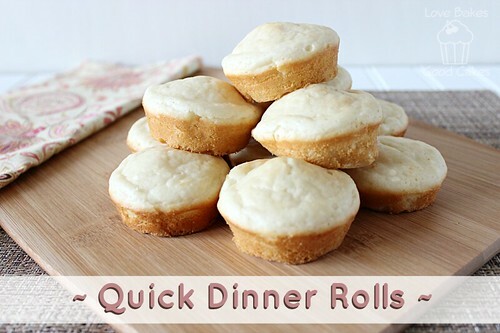 Bake for 40-45 minutes or until the top is golden brown. 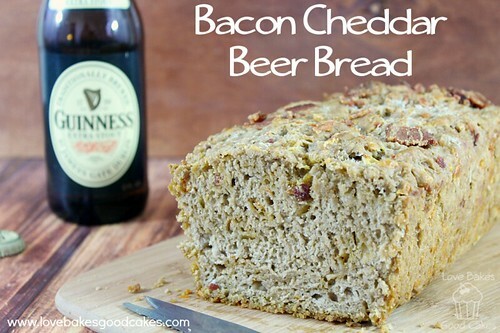 Guinness and bacon…in bread…I'm in! 😉 Looks awesome Jamie!! Found this bread at Saturday Night Fever — was so happy to see that it's yours! And how great you are a contributor for the Inspiration Network! Super fun. 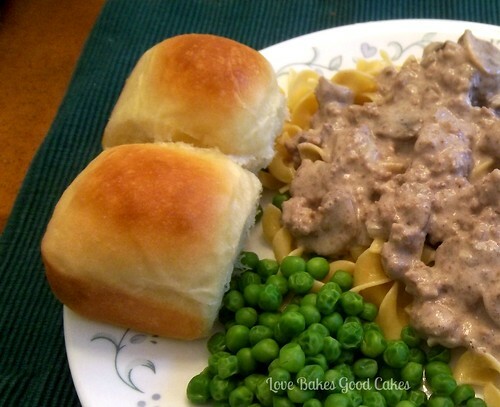 OMGoodness… You pretty much just combined my 3 fave foods into one! 😉 YUM! 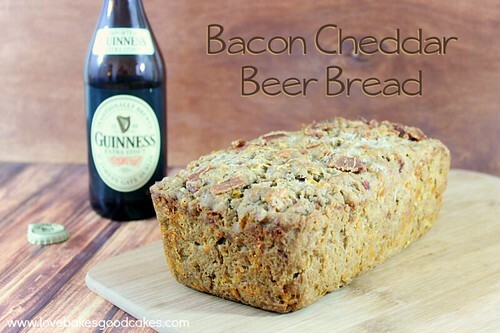 You had me at bacon, but add cheddar and beer in there and I'm golden! Thanks for sharing at Simple Supper Tuesday. I saw this at Time to Sparkle and had to click over and check it out. This is my kind of bread. Oh wow, this sounds so fantastic! Being a Wisconsin girl, this is right up my alley! Pinning for later! The ingredients are so interesting. I am anxious to taste how they all work together, they sound so good! This would be perfect for my Super Bowl Party! I am hosting a Super Bowl Eats and Treats Linky Party and I would love for you to link up your recipe or any of your recipes that scream "Super Bowl" party to you! You can link up appetizers, desserts, party styling, party crafts, sandwiches, beverages, anything you deem worthy of the big game. Link up as many as you want also. We would love to see you there! I like that this is a quick bread. It's hard to find the time to wait for dough to rise. Or maybe it's just that we like homemade bread so much, we get impatient! Thanks for sharing, Jamie. We would just love this bread, it looks awesome! Thank you so much for sharing with Full Plate Thursday and have a great weekend! Well, doesn't that sound yummy!! I think you covered all of the food groups in this loaf. Thanks for sharing it with us on foodie friday, a really fun bread.